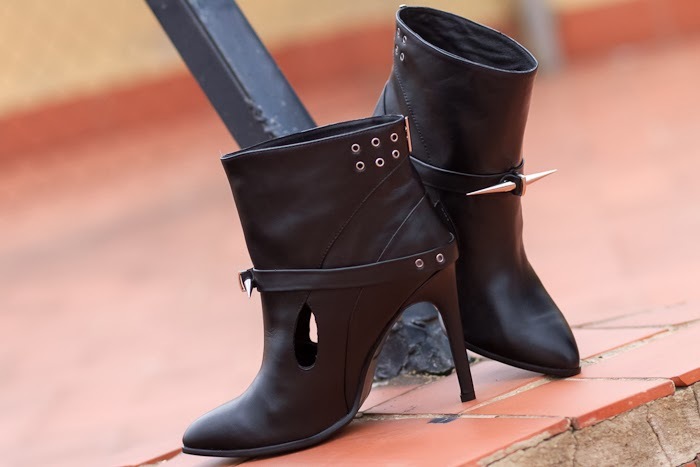 Hi beauties, today I want to share with you one of my last shoe acquisitions, this time an amazing pair of Spiked Ankle Boots with High Heels. 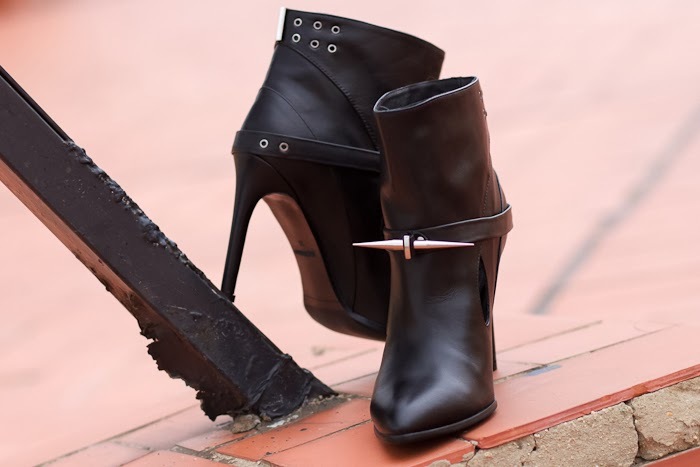 They drove me crazy when I saw very similar ones at Anthony Vaccarello's AW13 Collection. Hola guap@s, aquí me tenéis otro sábado más compartiendo con vosotr@s mi última adquisición "zapatil". 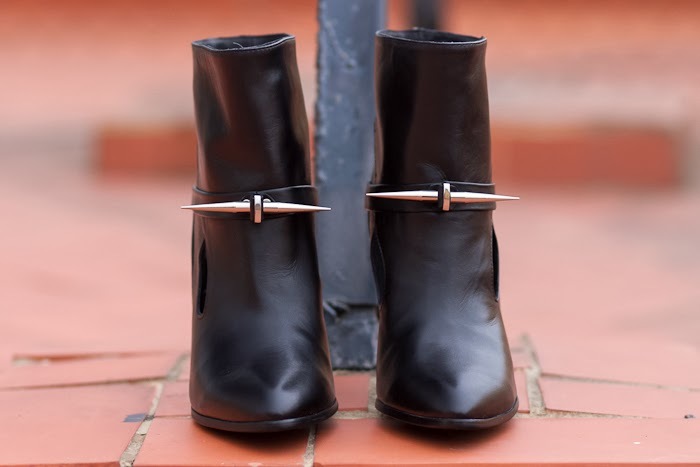 Esta vez son unos Botines de Tacón Alto y Fino con Pinchos que me tienen enamorada desde que los vi muy parecidos en la colección Otoño Invierno 2013 de Anthony Vaccarello. 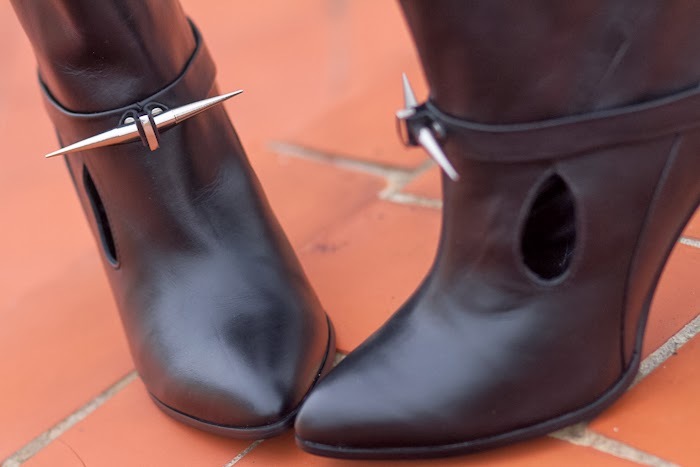 These boots are a little radical (one more time) because of their great spikes, but they are so pretty and feminine. 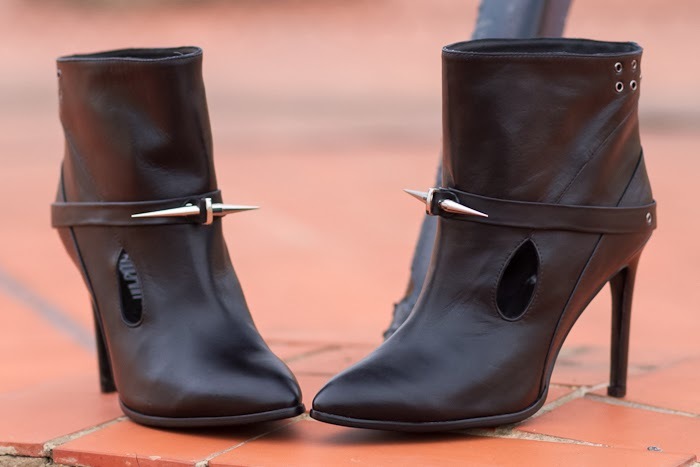 They are the perfect choice for my rockest chic outfits. I really love them! Needless to say I'm looking forward to wear them for the first time. You will see them on me so soon! Kisses and many thanks for your comments. Happy Saturday ! Como veis, son unas botas un poco extremas (una vez más), principalmente por los grandes pinchos del frontal, pero a la vez son preciosas y muy femeninas. Son el complemento perfecto para mis looks más rockeros. ¡A mí particularmente me encantan!. No hace falta que os diga que estoy deseando estrenarlas, muy pronto me las veréis por aquí. Un beso y muchísimas gracias por vuestros comentarios. ¡Disfrutad del Sábado! I will be happy when you follow my blog too. Son geniales, originales y poco vistos ante todo. OMG!!! They are soooooooo cool!!! grat pair of booties! love the metal detail on the front! I love these ankle boots. So chic. Absolutely fantastic! So rock style! Hola guapa!! Menuda macarrada mas chula!! Me han encantado! Me encantan, son súper originales! Un beso guapa. Ps. I'm going to start a new giveaway would you like to help me? You'll gain so much followers! so cool! love these rock booties! Wating to see how you'll style them! Son preciosas, me encantan los pinchos de delante. Deseando verlas en looks. Besiños. im a new happy follower ^__^ im following you on bloglovin' and with gfc i hope you can visit me soon! SO CHIC!! I love them! They are very unique! Oh wow! Que zapatos tan cool, me encanta lo extremos que son, so fierce! Sé que nadie los llevará mejor que tú y tu gran estilo! wow love those hot boots!!! love your new boots! so cool! It's not exactly my style so I'm really curious how you will wear them! For sure with a great outfit as usual!! Me encantan los zapatos, son geniales!1! que pasada de botines me encantan!